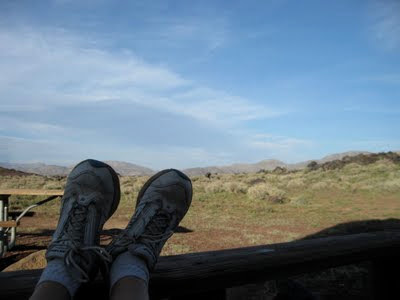 I was really getting the hang of the dry camping thing here at Fossil Falls. I was starting to really get what my boondocking buddies all talk about .. the wide open spaces, no neighbors for miles, get back to nature, smell the fresh air, read a book, listen to the birds sing kind of thing. I was getting that and loving it. Then, there is always a ‘then’ isn’t there? Then, the wind started to pick up and pick up quickly. I went from contemplative to hopping up and down saying ‘eww, ouch, oh that hurts’ all in a matter of minutes. I discovered that when you are sitting on an ancient lava field and the wind blows, it sends thousands of tiny cinder particles flying through the air.... and they HURT! I scrambled to grab my chairs before they wound up in Kansas, then get dog and myself inside and get the windows closed. I was too slow, I already had a layer of dust on everything. My slide awnings were flapping wildly. I pulled both slides in and sat down to regroup. I checked the weather and there were high wind warnings for 50 miles in either direction on Hwy 395 that were suppose to start at 10 am the next morning!! I’m thinking, 'uh oh this is gonna get worse'. The wind started getting even stronger and Bessie (the RV) started rocking and the wind was catching my AC covers in a way that sounded like they were gonna blow off any minute. It was now pitch dark and I was getting a bit concerned about our situation. Out in the middle of nowhere, all by myself, with no one to help should we get blown over... I thought, 'what the hell, at least in an RV park I would have neighbors going through the same thing.' (For some reason I find that comforting.) When the wind hadn’t let up by 10:30 pm, I decided to try and move the RV and angle it so the wind would at least hit the front of the AC covers, which is where they were designed for wind to hit. I really didn’t want to fully angle into the wind because I didn’t want the cinders blasting my windshield. I couldn’t move a whole lot because there were sharp lava rocks around that I couldn’t see to maneuver around in the dark. After an ‘ew, ow, that hurts’ trip out into the wind to assess how much I could move. I was able to get the angle I wanted. The noise from the AC covers died down a little and the shaking of the rig improved slightly. I was a little less fearful of being blown over. I found my ear plugs and the Excedrin PM and drugged myself so I could sleep while the rig continued to sway. Despite the drugs, I didn’t sleep much. The wind died down at 6:10 am, it was barely light. I had the car hooked up and was on the road before 6:45 am... Not bad for someone who’s feet rarely hit the floor before 9 am. So much for my ‘getting back to nature’ experiment... I headed to find neighbors and full hook ups! I _really_ liked my site at Fossil Falls, so I decided to stay another night and go check out the flower situation in Death Valley from here. 100 degree plus temps were predicted in Death Valley so I started early to make my trek. It was a pretty brown and boring trek to the first overlook in the park. I could count the number of flowers I saw on one hand. If you have followed me at all, you know I am WAY into flowers. I made the decision to turn around & go check out the lake and snow capped mountains I had seen back at my turn off from Hwy 395 instead of doing more in Death Valley and I was glad I did! Loved how the dry mtns on the east and snow capped Sierra's came together here. The lake I saw was actually a ‘dry’ lake that apparently has been the source of much controversy. 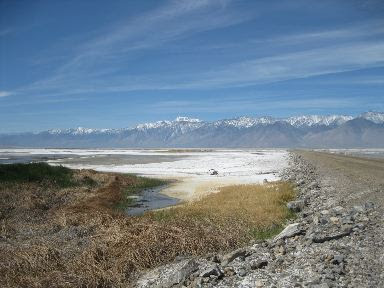 It is called Owens Lake it was apparently drained by overuse from the city of Los Angeles. The resulting dry lake spread dust contaminants throughout the area. Lawsuits resulted in a low water level being maintained in the lake. 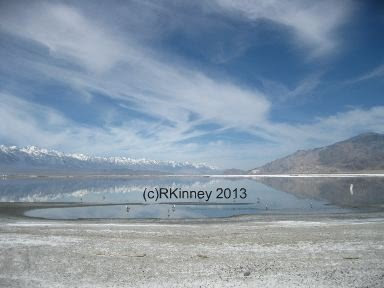 The result for me on this day was good birding and great reflections of the snow capped Sierra mountains. There are a series of dike roads that you can meander around on throughout the lake bed. I meandered until I got to a place where there were no tire tracks and the seagulls sitting all over the ‘road’ where looking at me like “WTH?”. It took me a while to negotiate my way back to a real road exit through the maze. The views & reflections in every direction were really beautiful. I found my way back to pavement and back to my Fossil Falls campsite. The day ended with a great sunset and an eagle soaring through the full moon rise. Does life get any better!? While visiting the BLM office in Ridgecrest I picked up a sheet on Fossil Falls which is about 35 miles north of Inyokern on Hwy 395. 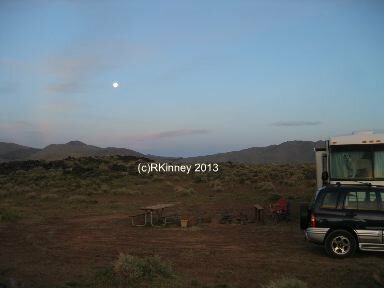 No one at the BLM could tell me if the Fossil Falls campsites were big rig friendly or not but a fellow camper told me he ‘thought’ that was where he had camper with his big 5th a few years back. Inspired by my Jawbone Canyon experience, I decided to check it out. I knew that any camping area that was only 1.5 miles down a gravel road couldn’t be too bad. I grew a little concerned when I had to stop on the washboard road and remove someone’s spare tire that had apparently come off without the drivers knowledge. I stopped at the first turn off on the road which happened to go to the campground to take a look at my options. I was greeted by a hiker who said, “your gonna have to unhook and drive out separately to get out of here!” That is not what you want to hear when traveling alone in a motorhome towing a car. Ahead of me was the end of the main road and a small parking lot. I am not sure I could have turned there if it were empty, but there were cars and a small travel trailer. My only option then was to take the campground road which was not a gravel road, but an uneven, lava rock rocky, deeply rutted, dirt road. I stopped at a wide spot by the registration and took a walk down to the Fossil falls, which isn’t really a waterfall. There used to be a waterfall and now all that remains is interesting holes and swirls and holes in the lava rock that the falls had once run over. Interesting but been there, done that, and now I just wanted to get the heck out of there without getting stuck, hurting my rig or having to unhook. I was concerned about one of the MANY lava rocks sticking up catching a sidewall on my rig. Finally when I was almost back to the gravel road I came in on there were a couple big sites that I would fit in. I checked my verizen card and phone both and they both worked. Being a bit stressed and the sites here looking pretty nice I decided to pay the $6 camp fee and stay the night and unwind. My site was lovely. It was big, it had a fire pit and a picnic table and it was fairly level. 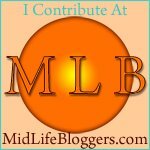 On my way back from paying the fee, I took a detour and followed a sign to Little Lake Overlook, which was several miles down a another gravel road. I asked at the Ridgecrest museum which of the many canyons in the area might be the best bet for wildflowers. She mentioned Short Canyon, which was probably less than 6 miles north of where I was staying in Inyokern. Dog and I headed up the next day and I was not disappointed! Driving up the to the canyon the desert was filled with thousands of white flower balls with some yellows and purple's mixed in. 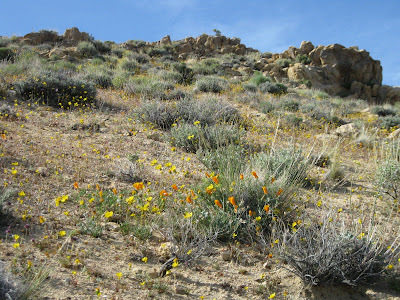 When we got the the parking area the hillside had many poppies, yellows, purples a few orange globeflowers. They weren't as dense as the whites were coming up, but they were still pretty and the variety was amazing. So dog & I climbed the hill to the ridge and spied a route that went further along the floor of the canyon. We went back and took that road and wow, what a find. 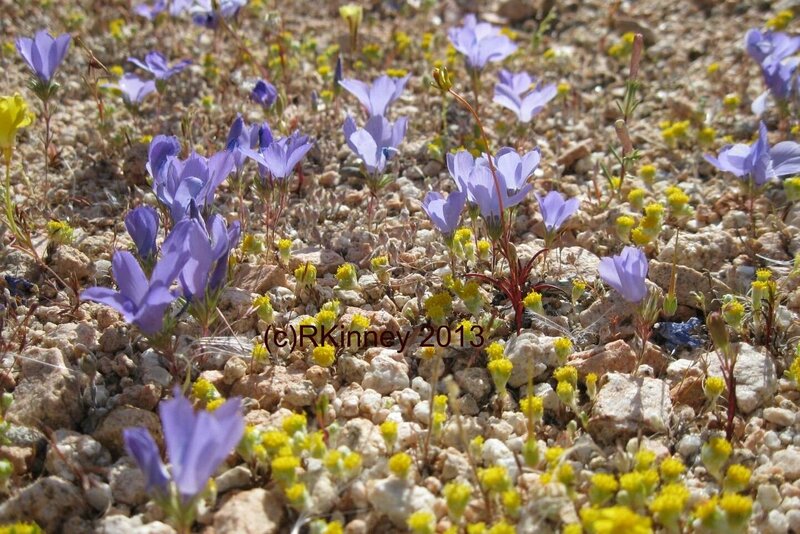 The desert floor was much more densely packed with small flowers. Bunches of yellows in one place, then purples, the tiny whites, then we found some primrose bunches. It was flower heaven! The variety and colors were just fabulous. I was quite the happy flower hunter that day. The next day I checked out Grapevine and Nine mile canyon but couldn't find Sand Canyon. Neither of those canyons had any of the fanfare that Short Canyon did. 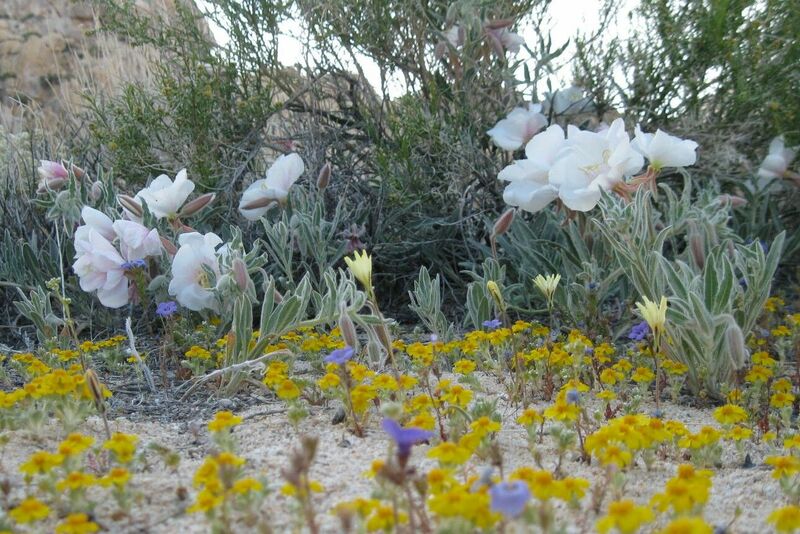 If you are in the area in early April and enjoy flowers, I recommend making the easy trek up to Short Canyon. There are many dirt roads in this area and I didn't have a 4wd map or guide book but this one is not hard to find. The best route is labeled (sort of). If you go north from Inyokern to the Brown road exit then turn west, you will see small signs that will take you on an easily passable in a passenger car route. Coming back the same way you go up is best if you don't have high clearance. I detoured on a short cut down and kind of did a bumpy sliding in deep sand kind of thing for a bit.